What’s a mash filter and how does it work? I read with interest the recent news about rye whisky being made in Scotland. In the description of its production, there were a couple of mentions of a ‘mash filter’ being used. It’s not something which I have read about before. Can you tell me what it is and how it works? 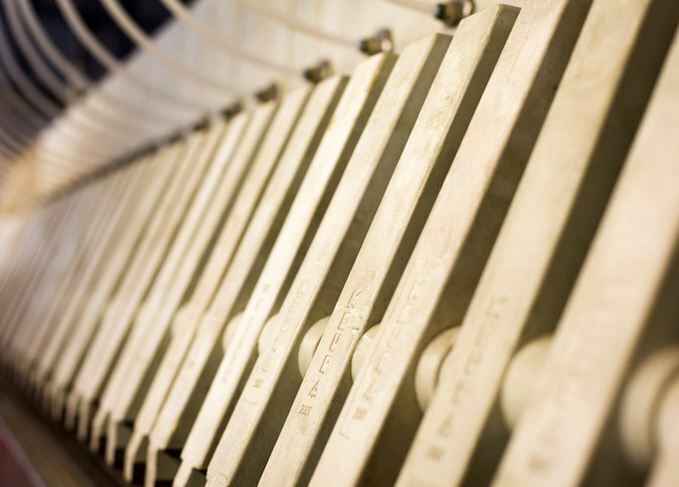 Although widely used in brewing for more than a century (Belgian brewer Philippe Meura built his first prototype in 1901, and his firm is still the main manufacturer), mash filters are less common in whisky. There is one at Midleton in Ireland and two in Scotland, at Teaninich and InchDairnie. Mashing involves the conversion of starch in the crushed grain (grist) into fermentable sugars by the addition of hot water. The sweet liquid (wort) is then separated from the solids (draff) and, after cooling, pumped into washbacks for fermentation. Normally all of this takes place in a single vessel – either a traditional mash tun or a lauter tun. The mash filter, on the other hand, splits the process into two. Conversion takes place in one tank, while the filtration and separation of liquid and solids takes place in the mash filter. As very fine grist can be used, there is no need to use the husk as a filter bed. The large number of filter plates significantly increases the ratio between grist and liquid compared to the standard mashing methods. Because the mash is evenly and thinly spread over a large number of plates, the process is completed considerably more quickly than in a conventional mash tun. The use of flour rather than grist also increases the extract (amount of fermentable sugars). The mash filter consists of a series of anything from 10 to 60 modules. Each of these has a fine polypropylene filter sheet on one side, a flexible membrane on the other, and a mash chamber in the centre. Both the filter plates and the membrane can be expanded by air pressure. The grist is mixed with hot water at between 64˚C and 65˚C in the conversion vessel. The mash is then added along the length of the filter, allowing each chamber to be flooded evenly from the bottom up. Once this has been completed, the membrane in each module is gently expanded, pushing the wort through the bed of solids into outlets at the top and bottom of the filter, leaving the solids on the filter sheet. This ‘strong wort’ is what will be used for the ferment, though the subsequent lower levels of fatty acids can have an impact on fermentation efficiency. After this, the pressure is dropped and sparge water, at 75-78˚C, is pumped along the length of the mash filter from the top to flush the system out. A final compression is then applied to collect all of the liquid and leave the plates dry. These ‘weak worts’ will be retained for the next mash. The pressure is then dropped and the plates opened, allowing the draff to be removed. The advantage of the mash filter is the production of very clear wort (which in turn can help to make a spirit low in or free of cereal notes) and, because less sparge is used, a higher gravity wort is achieved. It is also a system which can easily process ‘challenging’ malt – or other cereal grains, including rye – which conventional milling and mashing systems may struggle with. The downside is that they are expensive, and need more maintenance and cleaning. In addition, for it to work, the mash filter has to be completely filled, meaning that it can be less flexible in terms of the size of mash being processed. If a smaller mash is required, then blank plates need to be introduced (as done by InchDairnie for its rye), but this is time-consuming. There are also space issues – the system requires two vessels rather than one mash tun – which can mean that mash filters are not appropriate for older distilleries. For new-build distilleries wishing for specific characteristics, however, they could be a tempting option. Tours and tastings will celebrate the Highland distillery’s landmark this Saturday. War, women and whisky: the story of Hugh Munro, early 19th-century Laird of Teaninich, has it all.